I Loved A Rogue is the story of Eleanor Caulfield and Taliesin Wolfe, and is the final book in Katharine Ashe’s Prince Catchers series. 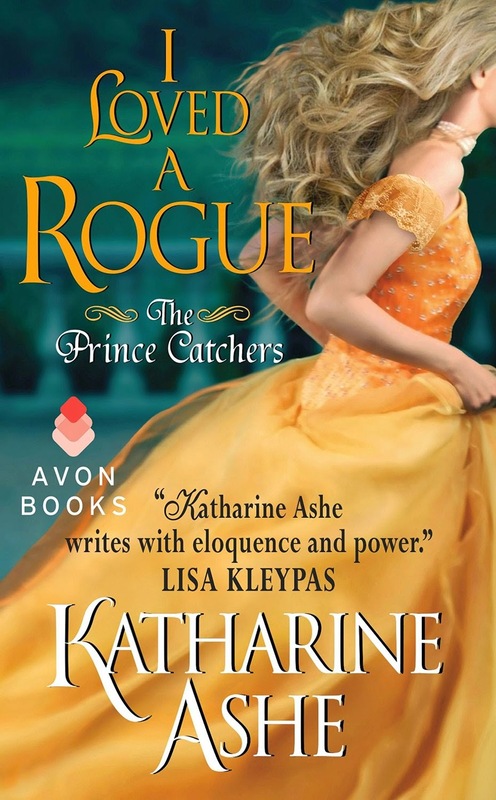 Like all of Ashe's other books, I Loved A Rogue is chock full of passion, intense emotions, mystery, and adventure. While I always like reading books in a series in order, each book in this series can be read as a standalone, so readers can jump right in with this book if they’d like. Eleanor Caulfield is the eldest of the three Caulfield sisters, who were orphaned at a young age. According to a gypsy fortune teller, one of the sisters must marry a prince in order to find their true identities and the truth about their parents and their past. Now that her younger sisters Arabella and Ravenna are happily married and settled, it’s Eleanor’s turn to go on her own quest and adventure to seek answers. Seen as the most proper, modest, and reserved of the Caulfield sisters, Eleanor nonetheless has a spirit that thirsts for passion and adventure. Having suffered a serious illness when she was younger, she went through an arduous recovery process that still has people thinking her meek and weak. In reality, she longs to break free of those chains and be the heroine of her own life. Eleanor is starting to feel stifled by her old life at St. Petroc, especially now that their adopted father, Rev. Caulfield has found a new wife. So, when Arabella offers her the opportunity to travel to Cornwall to search for more clues about their past, she jumps at the opportunity. However, there is a fly in the ointment in the form of Taliesin Wolfe. Tali, the man who has teased, infuriated, challenged, tempted her, and wreaked havoc on her heart and emotions since they were children, must accompany her. The man who abandoned her without a word eleven years ago but still ignites her passions like no ever has, will be by her side whether she likes it or not. I admired Eleanor’s strength and determination as she found the courage to take charge and be the heroine of her own life. Taliesin Wolfe has been under Eleanor’s spell since the moment they first met and there has been no other woman for him ever since. A man raised by a gypsy family, but as educated as any gentleman, thanks to Rev. Caulfield’s tutelage, Tali is a man caught between two worlds, and doesn’t feel like he quite belongs in either. But one thing has never changed-his love and devotion to Eleanor, and his undying gratitude to the Caulfield family. He will always be there if they need him. So, when tasked with accompanying Eleanor on her quest, he acquiesces even though he knows the temptation of being that close to Eleanor could very well kill him. You could just feel all the underlying tension and passion between him and Eleanor, and it truly was thrilling to see that play out. Tai and Eleanor truly were a wonderful couple. Ashe does a fantastic job of portraying the intense and conflicting emotions between them, and expertly weaving the threads of what happened in the past, and what’s happening in the present. They’ve both been hurt by the other and are scared to trust their hearts again, even as they are irresistibly drawn to each other again and again. The love scenes and passionate moments between them are breathtaking, and Ashe makes you feel every moment of doubt, passion, fear, determination, love, and pain that erupts between Eleanor and Tali. The moment when they are finally together is made all the sweeter because of all the emotional hurdles they had to overcome. As Eleanor and Tali embark on the epic journey, the answers slowly unravel. We do indeed find the answers to what happened to Eleanor, Arabella, and Ravenna’s parents. Ashe ties up all the loose ends to that storyline, and in vintage Katharine Ashe style, that story is also rife with passion, drama, danger, and intrigue, in the best way possible. I will give no spoilers as to whether any of the Caulfield sisters married a prince, but I was more than satisfied that Eleanor married her prince, just as her sisters did. I Loved A Rogue is a great book, and I definitely recommend it for readers who enjoy stories that pack an emotional punch and takes you on a roller coaster ride. There is a great cast of secondary characters, and I truly enjoyed catching up with Arabella and Luc, and Ravenna and Vitor. I’m also very excited that Katharine Ashe is going back and completing her Falcon Club series. I’m counting down the days until Constance’s story is out. I have heard about this series, but have not had time to pursue it. It sounds good, and now that the series is complete, I'll be looking for them. I prefer to read a series all at once. It keeps the characters fresh and makes the arc of the plot stronger. I haven't hsd the chance to read this series yet. I too love waiting till the series is complete & then I can sit and read them back to back without missing a beat. :). Thanks for the review. Sounds like my kind of story. Looking forward to it to - I enjoy her stories! I have been waiting for this to come out, to read all 3 together. Gorgeous covers on all of them & I love the story lines! It is perceivable why we tend to are thus interested in this fantasy. After all, if love could be a feeling, it makes the full geological dating method most easier, for more information click here Top 20 Love Quotes that Will Addict You To Love. Sounds like a wonderful series! Second chance romances aren't always my favorite, but this one, according to the review has passion, intrigue and mystery! I will look for the Prince Catchers trilogy. I'm also looking forward to the final Falcon Club book.